Bacteria can be defined as microscopic single-celled organisms that develop in diverse environments. They can live almost anywhere like: – in the oceans, human body and soil. They are neither plants nor animals. Some bacteria are destructive and cause various diseases like: – pneumonia, malaria etc. Not all bacteria are harmful. A few of them lend a helping hand as well. The Life Cycle of Bacteria is quite simple. The Lag Phase: – In this phase, bacteria do not grow. They understand their environment and try to adjust and metabolize. During this phase, they produce amino acids and vitamins which are required for division. Duration of this phase depends on the availability of nutrients. If enough nutrients are available, the duration will be short and if not then this phase will take time. Bacteria also make copies of DNA during this stage. The Log Phase (Exponential Phase): – In this Phase, bacteria get multiplied very rapidly. If provided favorable conditions then they can get doubled in approximately 15 minutes but if conditions are not suitable then this stage can take time. The time taken by bacteria to get doubled is known as ‘generation time’. The process through which bacteria gets multiplied is known as binary fission. 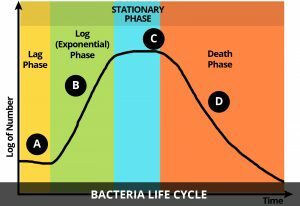 The Stationary Phase: – This phase is known as the phase of decline in bacteria growth. This decline depends on growth-inhibiting factors. Growth and death rates are equal in the stationary phase. The Death Phase: – As the name implies, it is the last stage. In this phase, bacteria lose the ability to reproduce. Declan, Tobin. " Fun Bacteria Life Cycle Facts for Kids ." Easy Science for Kids, Apr 2019. Web. 18 Apr 2019. < https://easyscienceforkids.com/life-cycle-of-bacteria/ >.